I’m a big hugger. Just ask my kids or any of my friends and family. And thank goodness they are big huggers, too. After a week like I’ve had, working well into the wee hours of the morning to meet a crazy business deadline, learning of the sudden passing of someone dear, and the usual day-to-day stress, a hug is the miraculous salve for a weary soul. Not everyone is into hugging like I am. My Dad’s military career relocated us all over the world, and the salutations varied by location. In Germany, a firm handshake was a must. In France, the double-cheek kiss was de rigueur. In Japan, the stately bow. In New York, the air kiss (and with so many people crammed into limited space, it’s probably better not to be sharing more germs than necessary). But maybe if more New Yorkers hugged, they wouldn’t be so cranky. And in Texas, where everything is bigger, so is the greeting, and hugs are welcomed. There have been documented cases on the power of human touch and the hug. A study at the University of North Carolina demonstrated that hugging decreases blood pressure, heart rate and the levels of the stress hormone cortisol. My favorite story tells of premature twin girls in a neonatal intensive care unit. Lying in separate incubators, one baby was thriving while the other struggled with breathing and heart-rate problems. At a critical moment when it seemed that all was lost for the smaller twin, a nurse tried an innovative technique of placing the babies together in one incubator. The stronger baby snuggled up to her little sister, and the tiny girl’s blood-oxygen levels and breathing became normal. Big sister hugged her sibling while they slept, and both children were able to go home with their parents after a few more weeks of co-bedding together. Sometimes, even a hug from a stranger can be a healing force. 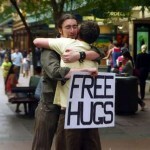 Juan Mann created the Free Hugs Campaign at a time in his life when he felt lonely and disconnected. 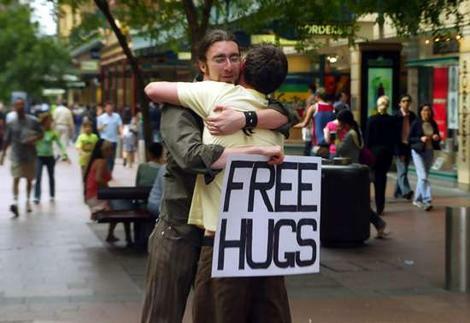 Instead of hoping and waiting for someone to come into his life, he took matters into his own hands, created a “FREE HUGS” sign and stood on a busy street corner offering hugs to others. Juan writes on his website that “for 15 minutes, people just stared right through me. The first person who stopped, tapped me on the shoulder and told me how her dog had just died that morning. How that morning had been the one year anniversary of her only daughter dying in a car accident. How what she needed now, when she felt most alone in the world, was a hug. I got down on one knee, we put our arms around each other and when we parted, she was smiling.” Before long, his campaign took flight and many worldwide were embracing his cause –literally and figuratively. So if you need a hug today (and even if you think you don’t), reach out to a friend, a child, sibling, spouse, neighbor, pet, or perhaps (very cautiously) a stranger. You never know who else might need a hug, too. The best way to get a hug is to give one. I’m sending you a great big, virtual bear hug right now. Thanks! I needed a hug today! Thanks for the hug! Often we need one but we are not aware of it! I just added to favorites this topic. Good info.